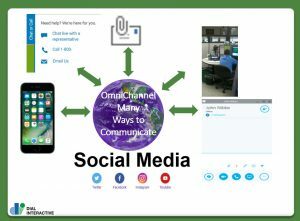 Your marketing department has done a great job getting a new prospect to contact your company, but now is when the heavy technology lifting starts with the use of our OmniChannel solution. Was the prospect journey mapped out correctly for your contact center agent to correctly speak with the prospect? Does your agent know that this prospect sent 3 emails, had 4 chat sessions and there were 4 post to social media before the prospect called in on the voice channel today? This is why the correct OmniChannel integration is so important to business today. The OmniChannel solution needs to be based on your company’s requirements, cloud /premise or hybrid based, with a solution dependent on the existing or future unified communication enviorment. The goal is to align your system to the correct technology for your organization based on an assessment and find the right solution for you.